The Washington Monument is a famous white obelisk located in Washington, D.C. 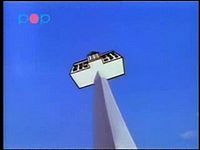 The Washington Monument appears twice in The Adventures of Super Mario Bros. 3 episode "Reptiles in the Rose Garden". Its first appearance is barely notable; it is merely shown in the background for a brief moment when the Doomship first arrives in Washington, D.C.
Later on, when Mario is trying to warp the White House back from Dark Land, he accidentally places the entire building on top of the Washington Monument, where it somehow manages to keep its balance. Fortunately, Mario is quick to correct this mistake, using the Levitation Beam to remove the White House from atop the Washington Monument and move it to where it belongs. This page was last edited on August 12, 2018, at 23:00.